Keeping the Moon introduces Colie, daughter of fitness guru Kiki Sparks. While her mom is on tour, Colie comes to the beach town of Colby, North Carolina, to stay with her eccentric Aunt Mira. Here she meets 20-something best friends Morgan and Isabel, who work at the Last Chance diner, and Norman, a talented artist who is misunderstood by his family. This book highlights summer as a time during which great changes can occur. During her summer in Colby, Colie overcomes the anxieties that have been with her since the days when she and her mom were overweight, and she learns to accept the imperfections of life as her Aunt Mira has done. There is also an important scene set during a fourth of July fireworks display which, for me, brings back all the excitement and anticipation of being out with friends on a summer night. In The Truth About Forever, Macy is trying really hard to be the perfect, practical, and reliable girl both her mom and her boyfriend, Jason, expect her to be. This has been her persona ever since her dad died suddenly of a heart attack, but lately, she has found herself wishing she could have grieved him a bit more instead of having to be the strong and steady member of the family. When she meets the employees of Wish Catering, Macy sees an opportunity to relax a bit and have fun without always being reminded that she is fatherless. As she is swept up in catering jobs, and also into a bit of a crush on Wes, she starts to get over her loss, but she also upsets her mom and jeopardizes her relationship with Jason. This one is a great summer employment story, which shows how coworkers can become like family, and how stepping outside of one's comfort zone for a summer can provide a new perspective on life. There is also a great scene in which Macy tells off her coworkers at the library job she took on as a favor to Jason that will satisfy anyone who has ever worked in an environment she hated. Another book set in the beach town of Colby is Along for the Ride. Auden's dad has recently remarried to a younger woman, Heidi, and the two now have a newborn baby. Auden is spending her summer with her dad and his new family, but things aren't going so well, mostly because her dad is very selfish and refuses to disrupt his routine to care for the baby in any way. In the meantime, Auden's professor mom is worried that Auden, who has started working at Heidi's boutique and has made some new friends, is changing and becoming less of the studious and serious daughter she has worked so hard to raise. Auden also spends a lot of time with Eli, who has been distant from his friends since the death of his best friend Abe a year ago. The summer spirit in this book comes across the most in the preparations for an annual celebration called The Beach Bash, and in Auden's late night wanderings with Eli. I also love the role of bicycles in the story, and the fact that Auden has never learned to ride while Eli is afraid to take up riding again without his friend. Riding bikes is a great summer pastime and even just the cover of this book makes me nostalgic for the days of riding my bike everywhere. 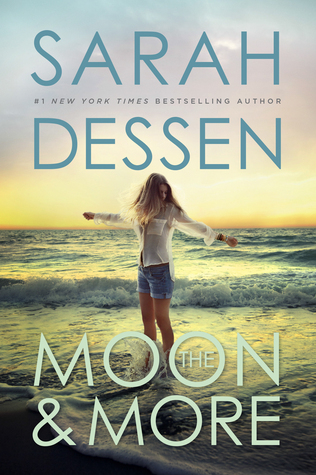 Finally, The Moon and More is also set in Colby, but it's from the point of view of a girl who has lived in Colby her whole life and wants to get out and see the rest of the world. Emaline's family owns a realty agency that rents summer cottages, so there are lots of descriptions of vacation-related problems. There is also a strong emphasis on transition and change, as Emaline's biological father and half-brother are in town visiting in the weeks just before her father's divorce from his son's mother, and Emaline herself is preparing to go to college, something for which her father had originally said he would pay, before taking back the offer without explanation. The Beach Bash also turns up again in this book, as do references to many of the businesses mentioned in Along for the Ride. 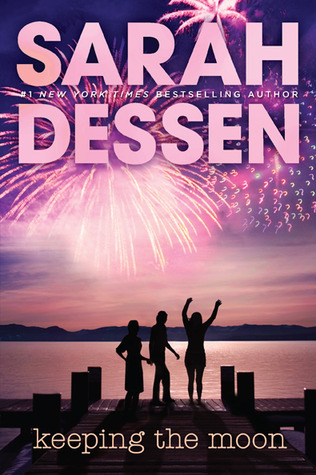 I know some of my readers are not big Dessen fans, but if you are, I'd love to hear which books of hers are your favorites. Which ones help you capture the spirit of summer? 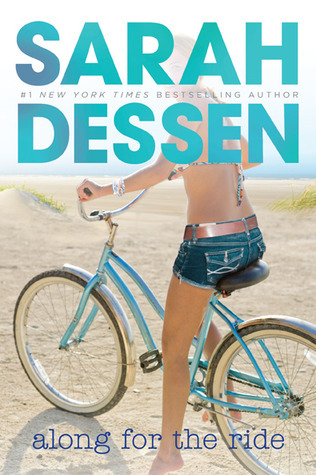 Oh, it's so cool that you got a note back from Sarah Dessen after her first book! I love that!! 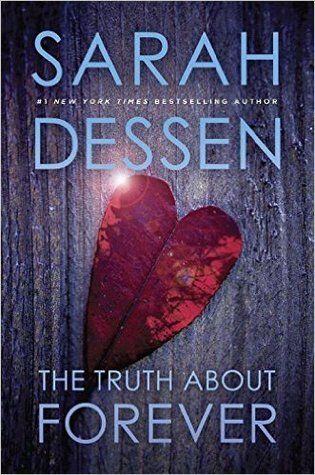 I have a confession to make: I've never read a Dessen book, even though I own at least one (maybe two?) of them. I need to fix that! !